Be the first to share your favorite memory, photo or story of Alvera. This memorial page is dedicated for family, friends and future generations to celebrate the life of their loved one. 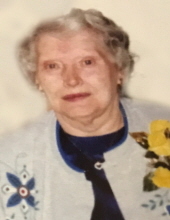 Alvera Anna Link, 97, of Maxwell, passed away Thursday, April 11, 2019, at the Madrid Home in Madrid. Alvera will be laid to rest in Peoria Cemetery near Maxwell. No services are planned. Alvera is survived by her daughter, Nancy (David) Goodwin of Texas City, TX; her grandchildren: Brian (Brenda) Goodwin of Dickinson, TX and Heather (Brad) Watkins of Dickinson, TX; and three great-grandchildren: Rylan and Cayden Watkins and Bri’ana Goodwin. She was preceded in death by her parents; her husband; her sister, Gladys Finch; and three brothers: Orville, Wilmer and Lester Kuntz. In lieu of flowers, memorial contributions may be made to the Madrid Home or Suncrest Hospice in memory of Alvera. To send flowers or a remembrance gift to the family of Alvera Anna Link, please visit our Tribute Store. "Email Address" would like to share the life celebration of Alvera Anna Link. Click on the "link" to go to share a favorite memory or leave a condolence message for the family.